the most important thing... to gaze on the beauty of the Lord, to have deep immersion in the Trinity, eternal ecstasy, unspeakable fulfillment and delight as a human person. We begin this on earth by meditative prayer, which leads to contemplative prayer as we grow normally. Make time for prayer as a top priority and then fit in the other things. Christian contemplation is a deep interpersonal love communion with the real God. It is so deep that it can only be received by God. St. Teresa of Avila said, You cant produce the least spark of it. John of the Cross calls it a divine inflowing. St. Teresa of Avila said, God alone suffices. She said that the path to union with God is prayer. Fr. 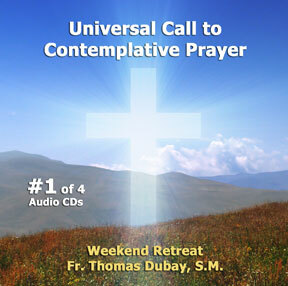 Dubay's retreat teaches about contemplation, the highest form of prayer, and how it is for everyone from all walks of life and all vocations. If we are in union with God, we experience an inner peace and joy no matter what is going on around us. We are made for eternal ecstasy. He said St. Paul got it right. Most of us dont unless we are advanced in prayer and experience this deep intimacy with our God. and this is the subject of this special retreat. Fr. Dubay mentions that the information given on the retreat is not something you generally hear during homilies at Mass but it should be. Pope John Paul II said to the Austrian Bishops, Your first duty as pastors is not projects and organizations, but to lead your people to deep intimacy with the Trinity. Here is an opportunity to learn what we might not have ever heard. However we often dont hear or learn about Christian contemplation, which is the Church teaches is the highest form of prayer. When we have this type of prayer and union with God, we are living life to the fullest in joy, thanksgiving, love and peace that Jesus came to give us. Fr. Dubay calls it the one important and essential thing in the spiritual life. or with others who are receptive and discuss them. For example, how did St. Paul rejoice always even while being beaten, stoned, shipwrecked, hungry, thirsty, often starving and left for dead in a pool of blood? He calls all of his sufferings very small: "Yes, the troubles which are soon over, though they weigh little, train us for the carrying of a weight of eternal glory which is out of all proportion to them. (2 Cor. 4:17) How can we be more like St. Paul and the other Saints who experienced joy even amidst trials? 3rd Theme: Prayer is called in scripture the one thing. 5th Theme: We are called to continual prayer. We might say we cant pray continually, but God can give it. It means being constantly aware of the Trinity. It doesnt interfere with what we are doing on the surface, but they go together. It is about love. 6th Theme: There is no limit to growth in prayer. You cant love God too much (or enough). A deep prayer life is absolutely basic and essential to the spiritual life to have this intimate communion with the Trinity. It prompts a person to want to live the Gospel full and to gladly give up petty clingings and selfishnesses. Every idle word a man speaks, he has to give an account on Judgment day. An idle word is a word that does no good at all. It benefits neither the hearer, speaker or a third party. The Bible says to overcome evil with good. If a husband or wife snaps, the other one doesnt return it with a snap, but with a gentle response. You overcome evil with good, because you are in love with God. A person cant flourish in life without a deep love for God. Saints say a complete yes to God; they are deeply in love with God. You cant produce this love yourself, but God gives it to the extent that we want it and are living the Gospel fully. The speaker and his message reach the hearer together. If the hearer finds the speaker repellent, the message hasnt a hope. It arrives discolored by, smelling of, the one who uttered it. Thats why arguments get nowhere. That is why if we love each other, beginning with love of God, and then share amiably, then we get someplace. We need a deep prayer life, or a deep conversion is not going to happen. This is getting to the core of marriage problems. The mere psychological approach, while having some beneficial insight, doesnt get to the heart of it. Sign up for the "Seeking Union with God Online Spiritual Formation Class"